Similar in concept to the heated seats in vehicles (that can reach temps of 90-120°F), the MasterCare “ComfortWarm” seat will reach a comfortable temp of around 110°F. UL & ETL listed. 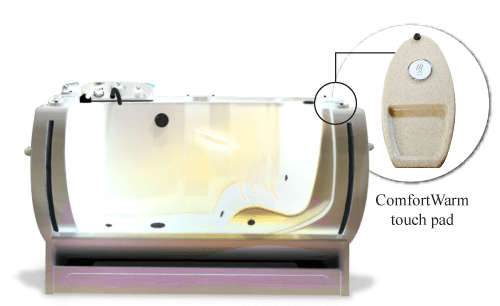 MasterCare continues to revolutionize the bathing industry by offering a heated seat option we call “ComfortWarm” for the Entrée spa tub! Available on new and existing tubs this affordable feature helps your resident’s feel even more comfy in their Entrée spa! Turned on and off with a touch pad on the Entree tub deck, the “ComfortWarm” feature enables you to offer your residents cozy comfort at the touch of a button!